Majestic Loveable Bears!! 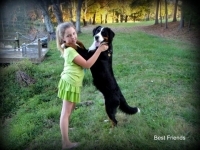 Our Bernese Mountain Dogs are Champion bred European Imports and Domestic Bloodlines. We breed the Bernese for companion and show. Our dogs are members of our family and a part of our daily activities, they enjoy running and playing on 30 beautiful acres. You will love cuddling up and getting a big bear hug from one of our Berner Puppies. We breed for disposition with the main emphasis on health and longevity. Our Adult Bernese Mountain Dogs go through a series of health and temperament testing before they qualify as a breeding candidate. Tests include conformation, disposition, movement, and hip and/or elbow testing as well as (DM) Degenerative Myelopathy. It is our belief that DM is one of the most important tests.The DM gene mutation is very common in the Bernese Mountain Dog Breed, as well as other breeds. Degenerative Myelopathy is a disease in which the dogs immune system is attacking it's nervous system. Today there is no cure for this tragic crippling disease, and most dogs are euthanized due to disability within 6 to 12 months of onset of signs. We breed to the highest standards, which gives you the best opportunity for a healthy puppy that will live a long, healthy life. 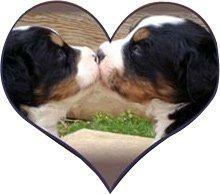 It is the goal of Majestic and all of our Majestic Breeders to produce the healtiest, longest living Bernese possible. We carefully research our pedigrees and never line or in-breed our dogs. Our puppies are born indoors to ensure their good health and even temperament. When they are old enough, they enjoy being outside in the fresh air and sunshine, by our 2 acre lake in the summer; while playing in the snow in winter. We are several families working together breeding true to AKC Standards to provide you with a family companion that will be with you for many years to come. Our puppies have large bone, blocky heads, wonderful out-going personalities, fantastic markings, and conformation. When we place a Bernese puppy, you are not only adding a wonderful Bernese Mountain Dog with the Gentle Loving Sprit to your family. You also have our combined 20+ years of experience and knowledge as reputable breeders for the lifetime of your Bernese. We are always available for any questions, advice on health issues, temperament, training, and/or diet. If, for any reason, you are unable to keep your family companion; we will always welcome back any of our Majestic Bernese Mountian dogs no matter what thier age. This is our lifetime Guarantee to all of our Berner Babies. Don't hesitate in contacting Majestic Bear Hugs if you have questions and/or would like to set up an appointment to visit our Big Beautiful Bernese. References available upon request including Vet's name and number. We stand behind our puppies with a 5 Year Health-Guarantee and a Lifetime Guarantee against Degenerative Myelopathy.